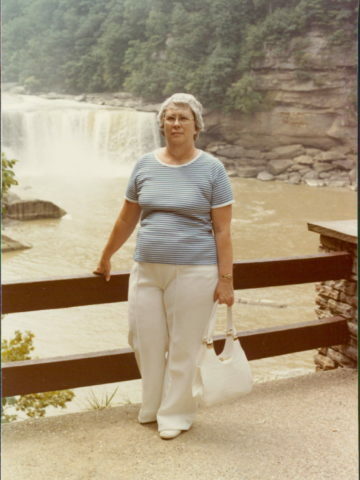 Naomi Frances Parsons Huston of White House, Tennessee joined her recently departed husband in Heaven on Wednesday, December 28, 2016, just 15 days apart. Naomi and Curtis were married 67 years on this earth and now will spend eternity together. Naomi was born January 18, 1930 in Charleston, West Virginia to parents, William Blain Parsons and Lucy Alberta Davidson Parsons. Naomi was one of eleven children, eight brothers and sisters have preceded her in death. She was also preceded in death by husband, Curtis Arthur Huston and son, Gregory Arthur Huston. Naomi was a homemaker. She loved taking care of her home and family. She especially loved baking. She was a member of The Church at Grace Park. She is survived by her two daughters, Connie (Michael) Moody, Karen (Greg) Frazier; brother, Robert Parsons of Charleston, WV; sister, Monajoye Presley of S. Charleston, WV; eight grandchildren and nine great-grandchildren. Services will be held January 4, 2017 at the Chapel of Grace Park with Pastor Bob Cook and Louie Roberts officiating. Interment will be 11:00 a.m. Thursday, January 5th at Middle Tennessee Veterans Cemetery. Visitation Wednesday 6:00 p.m. until the service at 7:00 p.m. at Grace Park.